LI (Lifted Index) is an indice used to assess low level parcel (in)stability of the troposphere. 2. How is LI determined? First note the temperature and dewpoint that is 50 mb above the surface pressure. Draw a line parallel to the dry adiabatic lapse rate starting from the temperature that is 50 mb above the surface. Draw a line parallel to the mixing ratio lines starting from the dewpoint that is 50 mb above the surface. The intersection of these two lines is the LCL. From the LCL, parallel the wet adiabatic lapse rate with height until the 500 mb pressure level is reached. Compare this 500 mb parcel temperature to the actual (environmental) 500 mb temperature. 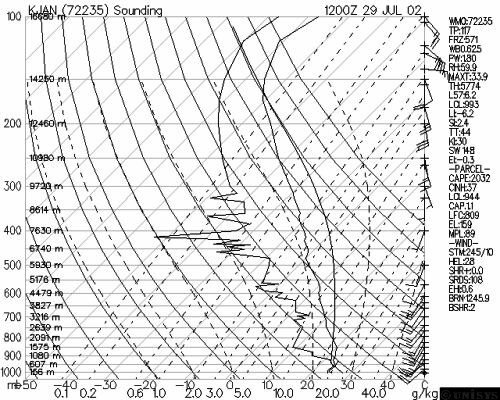 The sounding below shows an LI of -6.2. Thus, the parcel of air raised from 50 mb above the surface to the 500 mb level will be 6.2 degrees warmer (positively buoyant) as compared to the 500 mb actual (environmental) temperature. Instability: A negative LI indicates that the PBL is unstable with respect to the middle troposphere. This is an environment in which convection can occur. The more negative the LI the more unstable the troposphere and the more buoyant the acceleration will be for rising parcels of air from the PBL. a. The LI only assesses instability in one level of the troposphere. Unlike LI, CAPE is better at assessing instability in the troposphere as a whole. b. Only use the LI for warm season convection. LI is most relevant in the warm sector of a mid-latitude cyclone or in a barotropic troposphere. LI is worthless when a shallow polar air mass moves into the PBL and is usually worthless for forecasting winter precipitation.